Bowl, arcade, and laser tag your way into a whirlwind of fun at this premier gaming hot spot! Looking for something to do in Bristol? Look no further because Spare Time is waiting for you! “At Spare Time, FUN brings out something unique in all of us!” They pride themselves in being a great place for families, friends and birthday parties to let out their fun side. Join a league today to get your bowling on! Want to play just for fun? Open bowling is Sundays from 6pm until 6pm Fridays at $4.29, and Fridays after 6pm until Sunday at 6pm for $4.59 per game. 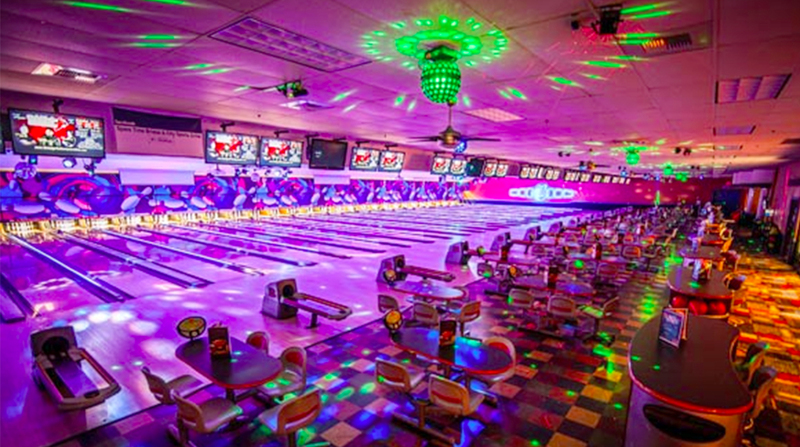 Galactic bowling is every Friday and Saturday late night transporting you straight to the galaxy as the bowling alley gets transformed and glows in the dark with laser lights. You won’t want to miss out. Spare Time is more than just a bowling center! Check out their arcade, laser tag and video games. The arcade is equipped with over 45 games to play and ensures that everyone has a prize! Want to battle it out in real life and not through video games? Battle it out in their exhilarating laser tag with music, fog, LED lighting and special effects! Voted one of the best places to have a birthday party in Bristol with options for kids birthday parties, laser tag, or birthdays for tweens and teens, you can’t go wrong! Birthday parties include bowling, shoe rentals, music, light shows, pizza, soda, balloons, a game card, free game of bowling coupon and even a party host! You can even add laser tag to the birthday package for ultimate fun. Now let’s see what you got, ready, set, strike!